If anyone is looking for an idea for a Lego party, I have one for you. This is a brilliant idea and a great use for any baby food jars you might have laying around. I will be tucking this idea away in case little geek wants a lego party at some point. You don’t have to use baby food jars either. We get some phenomenal Caramel Cashew Trail Mix at Target that has the same shape of jar but it is much bigger. You could store all kinds of things in there and use them for decorations. Come to think of it, you could make pumpkins out of them too. Hmmmm…. What a nice idea. I like the idea of the trail mix containers from Target because the containers are plastic (kid friendly), and like you mentioned, much larger. I absolutely LOVE these! I did a Lego party for my son last year and these would’ve been fabulous! 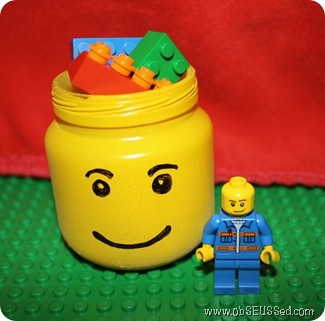 I’m now wondering about larger storage jars!? Excellent inspiration… thanks!